Cameroonian legend Samuel Eto’o had arrived Nigeria in style for Joseph Yobo testimonial game but his attempt to go back in style was halted. 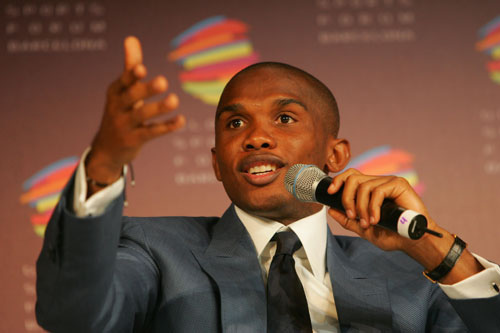 According to the report, Eto’o who was on the score sheet for Team World as they went down 5-4 to Team Nigeria, was to fly back immediately after the game on his private jet, but to no avail. Airport authority claimed he didn’t have permission to land at the Port Harcourt airport and fined him. A source said after paying the fine, his plane was still not allowed to fly, up until late last night. Team Nigeria defeated Team World 5-4, in front of over 10,000 spectators as stars light up the Adokiye Amiesimaka stadium in Port Harcourt, the Rivers state capital. Emmanuel Emenike scored a hat-trick for Team Nigeria, which had the mercurial Austin Jay Jay Okocha pulling the strings. Former Everton and Manchester United boss, David Moyes, took charge of Team World, that boasted stars like Samuel Eto’o, Stephen Appian and Sulley Muntari.